Why is Pez Called Pez? There are certain foods and experiences that give you an unbelievably strong sense of nostalgia. For me, it’s when I see kids playing street hockey, when grocery stores start stocking their shelves with purple bags of Cadbury Mini Eggs and when I stroll by Pez dispensers on aisle caps. I just turned 30, but it feels like just yesterday when my twin brother and I would race to the store on our rollerblades to purchase the newest Pez Dispenser. It was basically the equivalence of an iPhone launch, minus the long lines and the media. Like other food and beverage brands, Pez Candy not only has a interesting story behind their catchy brand name, but also behind the evolution of their brand and the expansion of their product mix. It truly is one of those products you pick up and think “Why didn’t I come up with that?” But that’s normally where the train of thought ends; we just assume it was an overnight success and move on. When in fact, the opposite is often true. The story of Pez is no different, it’s a fascinating story of one re positioning story after another. 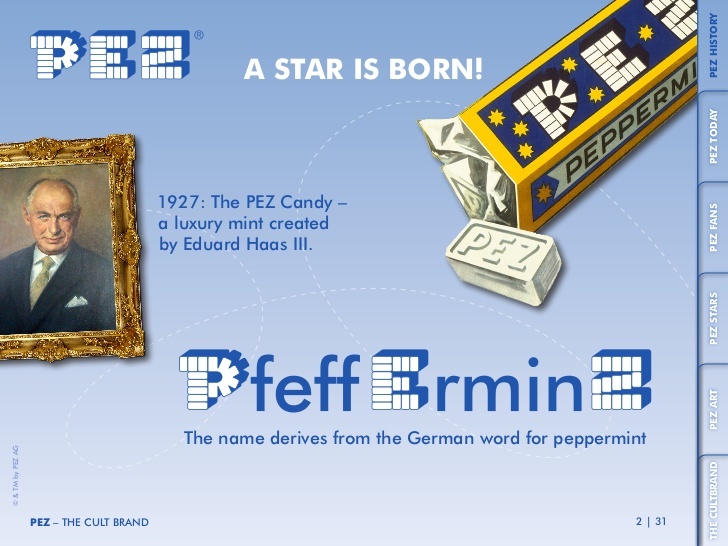 Less commonly known, Pez was founded way back in the 1920s by an Austrian businessman named Eduard Haas III. He was born into a wealthy, entrepreneurial family of doctors and retailers. And to no surprise, he got started early, patenting his grandfather’s baking powder mixture for cakes and eventually selling the powder all over the Austro-Hungarian Monarchy. According to the Candy Hall of Fame, in 1927, Haas III began by “working with a chemist, who developed a process to cold-press the sugar-based tablets, allowing the peppermint flavor to be enjoyed without the loss that had occurred through previous heat-based manufacturing processes.” Initially, he launched round peppermint candy called “Pez Drops” but shortly after changed the shape to a thin brick tablet, which they continue to manufacture and sell today. As a vocal anti-smoking advocate, he positioned the mints as an alternative to smoking, using the clever messaging “Smoking Prohibited, Pezing Allowed.” With an already a strong product, the advertising boosted the brands popularity, which inspired them to open more manufacturing facilities to scale the business. Why is it Called Pez? The name PEZ comes from the German word for peppermint, “PfeffErminZ,” taking the P from the first letter, E from the middle and Z from the last letter to form the word PEZ. In 1949, with the help of inventor Oscar Uxa, they introduced the first ever Pez Dispenser at the Vienna Trade Show. A few years later, they extended their operations to the US, establishing an office in New York City and landing their first U.S. patent:2.620.061. In December of 1952, they recognized that their once successful product and marketing strategy wasn’t unique enough to differentiate their brand in a more crowded marketplace. Eduard accepted this and went back to the drawing board. This led to the discovery of modeling dispenser tops after popular cartoon characters and marketing them to kids, a complete 180. 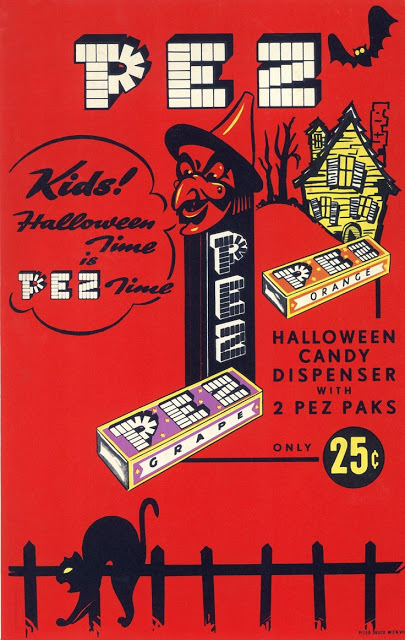 During the 60s, they introduced different candy flavored Pez, Pez Pals and Pez comics. And if we fast forward a few decades to the 90s, they held their first ever Pez Collector Convention in Menton, Ohio (there’s no doubt this guy would have been there), introduced Fuzzy Friends and celebrated their 80th anniversary with the launch of a Disney Mickey Mouse collectible tin. Shifting their product strategy, targeting a new segment of the market and doing licensing deals with movie studios probably created more global success than they anticipated.